If you can’t afford five grand for the second hand hardware, Softube’s plugin Weiss DS1- MK3 is a more than worthy substitute. Transparent when you want it to be, punchy and hyped when you don’t. New RMS and True Peak limiter modes. Waveform view is very informative. The end result of a three-year development collaboration between Softube and hardware manufacturer Weiss, DS1-MK3 is an exacting emulation of the extraordinarily posh digital mastering compressor/limiter of the same name, initially released in 1990. The original DS1 code has been ported to the software line by line, so it should, in theory, be identical to the real thing in terms of performance. However, Softube has increased the processing resolution from 24-bit/96kHz to 32-bit/192kHz (it’s still 40-bit internally), made the ‘LCD’ display more interactive and functional, and added two new Safety Limiter algorithms to the original one: Type 1, for high-RMS material, and Type 2 for True Peak limiting. DS1-MK3’s GUI recreates the hardware fascia beautifully - it’s clean, clear and sensibly laid out. The redundant softkey buttons have been reassigned to switch the Gain knob between controlling Input, Output and Limiter levels, and activating the nifty Waveform View. Softube’s new preset browser, however, is a UX nightmare. It’s huge and it floats stubbornly on top of all other windows, so on our 13" MacBook Pro, we have to drag it out of the way or dismiss it entirely to be able to see the plugin again (or anything else). We appreciate the ability to tag our own presets and - to a lesser extent - attach photos to them, but all that could have been implemented without such an ostentatious, intrusive interface. We really don’t look forward to meeting it again in future Softube releases, we have to say. Moving on, DS1-MK3 is a compressor/ expander, followed by a brickwall limiter. It can be switched between L/R stereo and mid-side routings, with the Ch1 and Ch2 buttons selecting each channel for parameter editing, and the Ganged button linking Left and Right or Mid and Side. Sidechain linking is activated/deactivated separately. The Safety Limiter has no controls other than On/Off and input Gain. 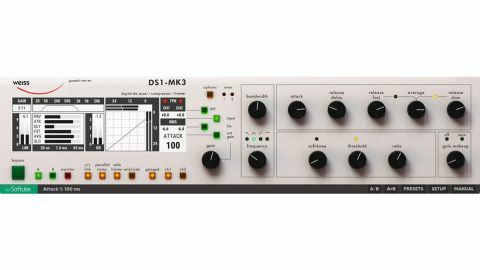 DS1-MK3 uses a delay-based lookahead system to do away with overshoots and other artefacts - a big deal for the hardware, but not so much in the software domain, where lookahead is a ubiquitous feature among high-end effects. That doesn’t detract from its effectiveness, though, and the ability to adjust the lookahead time (up to 63ms) with the Preview slider in the LCD display is very useful for tailoring transient response. Bundled with it (and available on its own for $199, which, again seems quite pricey), Weiss MM-1 Mastering Maximizer is a cut-down version of DS1-MK3, using the exact same algorithms, but with all of its big sibling’s parameters set automatically in the background via five preset ‘Styles’. Simplicity itself to use, the only front-facing controls on MM-1 are Amount, Parallel Mix and Limiter Gain. Amount increases the depth of compression applied, the specifics of which are governed by the selected Style, while Parallel Mix is a straightforward wet/dry balancing knob for the compressed and uncompressed signals. After the compressor, brickwall limiting is applied, with the Limiter Gain pot boosting or attenuating the input to the limiter by up to 18dB. The five Styles comprise Transparent, Loud, Punch, Wide and Deess, each one delivering exactly the results its name suggests. Transparent is the ‘default’, serving up amazingly unintrusive maximising, while Loud aims for maximum RMS, and Punch prioritises impact and weight. Wide is the mid-side option, emphasising stereo breadth and space; and Deess is, obviously, a de-essing configuration, for mixing as well as mastering. The main compressor parameters are housed in the right-hand half of the plugin. The Attack control ranges from a crazy-fast 0.02ms (roughly a single sample) to 800ms, while the Release stage is rather more complicated, involving the balancing of Fast and Slow Release parameters with the Average knob to determine its RMS response and shape. The release onset can also be delayed by 0.02-8000ms, for impressive precision when it comes to smoothing out pumping artefacts. The compression Ratio control ranges from 1:5 (expansion) all the way to 1000:1 (hard limiting). Of course, you don’t get the full range of values in between those two endpoints - the increments start to widen significantly beyond 10:1. The curvature of the knee is adjustable, too, from a sharp angle with Soft Knee set to 0, to a very long curve (down from 0dBFS to twice the Threshold) at 100. Rather than add a wet/dry mix control to DS1- MK3, Softube have moved the Parallel Compression button from the menu-driven options to the front panel. This simply sums the dry and processed signals, with the Gain Makeup knob setting the level of the latter. DS1-MK3 also offers frequency-specific dynamics shaping. Select a filter type (low-pass, high-pass or band-pass), adjust the cutoff or centre frequency with the Frequency knob, and narrow or widen the width of the band-pass filter (if selected) with the Bandwidth knob. Only the filtered frequencies are compressed, enabling levelling of just the highs in a mix, the lows or anywhere in between, as well as de-essing and targeting of problem areas in individual instruments. Clicking the Monitor button solos the filtered signal, helpfully. Speaking of monitoring, DS1-MK3 provides a lot of information via its faux LCD display, including input, output (peak and RMS) and gain reduction levels (the last separately for the compressor and limiter), the dynamics transfer curve and clipping indicators. There’s also the excellent Waveform view, which shows gain reduction, peak and RMS levels over time. DS1-MK3 oozes quality from every pixel. Supremely transparent, surgically tweakable and empoweringly versatile, it’s a formidable enhancer of full mixes, group buses and even individual track elements. The speed, precision and cleanliness of the compressor are key, but the limiter sounds awesome, too. Make no mistake, though, this is an ‘expert’ processing tool in every sense of the word, as reflected in the eye-watering price. If you don’t possess the requisite engineering experience, understanding and ears, walk away. However, those with the skills and funds, and who like the idea of having a phenomenally accurate virtualisation of one of the greatest mastering boxes ever built in their DAW or audio editor, are in for a real treat.